Denial is a powerful force that helps us protect ourselves. When is it OK to address this defense mechanism in others as related to drinking and alcohol abuse? Suggestions that can help you answer the question, “Should I tell an alcoholic they are in denial?” here. What is the psychological state of denial? “Denial” is a term that we use in modern language quite often. People “deny” or prohibit themselves from certain actions. You can be “in denial” of your true behaviors or feelings. Or we can make an event smaller in our head in order to feel better about it. But what is denial? And when are people in denial? Psychologists use the word DENIAL to describe the state of mind some people use to cope with reality. Theorists such as Anna and Sigmund Freud believed that we use denial to protect the immature ego self from feelings of guilt, anxiety or inferiority. In the most basic sense (and what’s important for our discussion here), denial is the insistence that a known fact is false, even in the face of overwhelming evidence that the fact is true. And further, denial is the refusal to acknowledge what has, is, or will happen. How do you know an alcoholic is in denial? 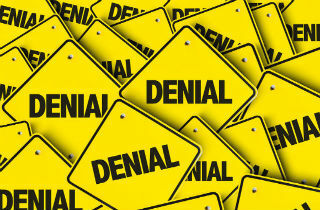 The general existence of denial is fairly easy to confirm, even for non-specialists or people untrained in psychology. In fact, most alcoholics will reject the fact that they have a problem with drinking at all. As alcoholics further develop dependence on alcohol, they also progress from inattention to willful blindness of problem drinking, a defense system that allows them to ignore the problem. Instead, alcoholics tend to blame problems related to drinking on something or someone else. Recognizing and accepting an alcohol problem is the first step toward getting better. But denial of alcoholism symptoms is fairly common. For example, even when people experience withdrawal symptoms from alcohol, they nearly always deny that they have a drinking problem. This defense mechanism ultimately leaves it up to co-workers, friends, or relatives to recognize symptoms and to encouraging alcoholism treatment. This can be tricky. Anthropologists suggest that the ability to look the other way, while potentially destructive, is also critically important to forming and nourishing close relationships. Sometimes, it is wise to manage a difficult person or personal situation by ignoring a problem but other times silence can bother our conscience. When should I confront an alcoholic about problem drinking? Ultimately, ONLY YOU can know when to inform someone about problem drinking. Your conscience will guide you. And so will best practices for alcoholism interventions. Click here to learn more about alcoholic intervention techniques. And leave your messages, questions or comments below. We are here to help. This may seem harsh, but I’ve cut an alcoholic in denial out of my life. I’ve seen him once in 10 years, but he has frequently called me. I’ve offered plenty of advice on how he could get jobs and repair the havoc his alcoholism has created over the years, and watched him really slide in the last 10 years. His calls had become longer and longer, and less and less sensible. Then one evening, he exploded at me because I told him that I didn’t want him to find me a girlfriend (I’m going through a tough divorce, and really don’t want one, something I had told him a number of times before). He was offensive. Three days later he left a message that was critical of a woman who works for me, within earshot of her (fortunately, I erased it before she heard it). He sounded drunk in the message. I had to warn her not to talk about herself, work or me to him, because it would get back to me, and that I would also do the same. He kept calling, and after a few weeks, I took his call. I told him that I was really upset by what he had said the last time we spoke. He said that he didn’t know what he said – he had no memory of it, because he had been drinking for pain management purposes (just like the doctor ordered). I told him he was blackout drunk, and implied that he had to stop drinking. He didn’t get the message. I also told him that the message he left about my employee could have caused a problem, but I had been able to prevent that, fortunately. He continued to call to see how she was doing (he knows her) until I told him not to ask about her again. Finally, today, because my employee said that he would keep asking her what was going on, I wrote him a letter telling him how I could no longer talk to him any more until he stopped drinking, because not only was he offensive, he was also getting in my way of my making a living. I doubt that he’ll get treatment, and he’ll probably simply be furious. I had thought about calling him to tell him this, but figured that my message would be met with denial and anger, and didn’t want to get into an argument over this. But now I’ll be the bad guy. Unfortunately, sometimes you have to move on from destructive people who are in denial. My boyfriend is an alcoholic. There has been a break through. Hello worried. You are not alone. I suggest that you read and contact some of the resources outlined in this NHS document about caring for an alcoholic. And post back here any time you like with questions or just with more worries. You are not alone! Firstly i think my situation is a little different. My Husband admits he is an alcoholic, so luckily one step down. However that since he has admitted it and stopped drinking, i think? his moods are obviously rather erratic and he gets into bad moods and tries to start arguments, perhaps looking for an excuse to drink? who knows? However he absolutely denies that he is in a mood and tries to pin the argument on me? he has only not been drinking for just over a week and refuses to seek help and admit that his drinking affects his moods whether drunk or not. Its like a huge elephant in the room and he just wont talk about it. Says he is doing something about it and i am imagining his moods. I have lived with an addict before and i know the signs, my sister is an alcoholic. How do I avoid these constant arguments and stress. Its making me ill and cant be good for my child either. We got married a year ago, I lived in South Africa and moved to the UK with my Child to live with him 6 months ago. It has been a very stressful move away from my friends and family. I am all alone in a foreign country with a Husband who is an alcoholic. OK, Mariae. First, if you have health insurance, call to find out about mental health providers the insurance company will cover. Then, look for a therapist in either of these directories. Let me know if this is a good start. If you need more information, I’ll look into more specific regional or country based counselors for you. Just let me know. Yesss pls,ASAP! !,i’m following his foot prints,becoming a hermit and depessed with the situation. Hi Mariae, It sounds like you are really stranded and alone in this situation. I’d’ suggest that you leave his mother out of it, and seek help for yourself! You need to find the courage to do what is best for you, and that may mean leaving. But, talk with someone (like a counselor or psychologist) and get a plan together. Do you need some help finding someone who can talk to you via the internet? Life is short too to be heartbroken all the time! My husband is an alcoholic and when he drinks he’s abusive and mean,and i still love him,even when he say:He does not love me anylonger but he wants to be my best friend!!!! and i always going to be missed and loved by him. His libido is over,he isn’t potent any longer. Hello,i’m so confused,he’s going mad or i’m going mad? I want to talk to his mother about it as we are living overseas( his job)and i want to leave ASAP as i can’t take anylonger.She should have a share of it,as she was married to an alcoholic husband too(his father),and she’s one to blame for his problem as she’s being economical mean to him!,She have had broken lotss of promises. I cried myself to sleep everynite since he moved to another room. Jemma: Spare your child a life with an alcoholic father by leaving your husband. Tell him to call you when he’s ready to accept he has a problem. Your husband sounds like a total jerk who treats you like a dog. Until he can muster some respect for you and at least accept his problem, tell him to forget having a relationship with you. Worried Wife: One more thing, you should NOT go to an AA meeting and lie about being an alcoholic. It’s not fair to the people there who are honestly seeking help, and you would be putting yourself in a bad position when it comes to your husband. Right now, your husband is an alcoholic. He isn’t receptive to your attempts to help him, so you may want to tell him to call you when he’s ready to face his problem. Until then, I think you should leave him, and tell him why you’re leaving him. That’s my opinion. Worried Wife: My brother is an alcoholic who sounds similar to your husband. He’s a binge drinker. He and his wife have been married for just over a year. His wife is incredibly tolerant and patient with him and seems like a really nice person. I feel very badly for her, and I’m furious with my brother. I think he’s a coward for refusing to get help, and he’s treating his wife like dog sh*t. Problem is this is their marriage and I don’t feel it’s my place to constantly ask her for updates, as if she were my spy. I can’t say I’m close to my brother, but I also don’t want to see him die because of this (he’s already been severely injured as a result of his being drunk). He gets incredibly defensive when the topic comes up – he’s berated my mother numerous times just for bringing it up. Worried Wife, my advice is to leave your husband until he at least agrees to get help. “I’m tired of this bullsh*t” is a perfectly acceptable way to feel. Act on it. He really thinks that because he doesn’t drink everyday and only occasionally not even every week, that he hasn’t got a problem. But when he does drink he just can’t stop he is adamant that he can but I’ve only been let down on all the times before and I thought our marriage which is great (apart from this) was worth more to him. He just lets me down and I don’t want my baby to be let down. His friends are big drinkers too and my husband feels that he has to keep up and that I’m the bad one I understand he must think I’m the alien when his own parents encourage it and they drink everyday and I’m scared he might turn out like that. I know he won’t ever stop the drink especially for life I’m scared to ask him to do that because I know what he will choose and I love him so much he is the only boyfriend/husband I have had so it is so hard but then I ask do I want to live with fear of my own husband having a day out with his friends. My mother said to me to just let it be, she said you wouldn’t have to worry about him cheating as no one would go near him in that state. I think she is telling me that so I don’t get too stressed in this pregnancy and they wouldn’t want me to be a single parent. He has never been violet towards me but could this happen? At times I’ve thought am I possessive not wanting him going out because sometimes people have said “well he don’t do it often, he loves you you can see it” Which I believe he does. He said that he couldn’t cope with me being ill and he planned all along to get drunk and when I asked him why he told me that he wouldn’t he said “I just told you what you wanted to hear” I never thought he was like that. I live near Birmingham (Tamworth). Thank you so much for your reply. Hi Jemma. I hear that you are scared and heart broken. Your husband needs to be ready and willing to stop drinking FOR LIFE in order to make the changes that he promises. You may want to schedule an intervention with an alcoholic psychologist, and be prepared to leave him in order to take care of yourself and your child. During an intervention, you address the alcoholic behavior and its impact on you, and ask your husband to seek treatment. If he doesn’t want to stop drinking and seek alcoholism treatment, you should be ready to move on and take care of yourself. Do you know where to find a psychologist or social worker who can help you during this time? And are there Al-Anon meetings where you are? Please help. My husband has been a binge drinker for a very long time. I have been with him for 10 years and married 6. The drink has always come first in our relationship. If he ever goes out without me I don’t expect him to return until hours and hours later, he too is the last one who will leave the pub. I’ve tried threatening to leave him, and left to live with my mom he will then come round saying his sorry & I forgive him and he promises it will not ever happen again and he really believes he can control his drink. He locked me out once in the snow and didn’t answer the door despite me trying to smash the window he was that drunk when I returned home the following morning the bed sheets were in the wash with sick on them. He has gone to pee on my clothes in the wardrobe before as he thought it was a toilet and I have had texts from friends telling me how drunk he is. When he goes out I’ve said to him before that I’m scared and he promises even swears on my life that he will not get drunk but he always lets me down. I’ve filmed him before and he was shocked the next day when I shown it to him. His family mom/day are both alcoholics and he hates it but I’, scared he will turn into them. They encourage drinking so really doesn’t help when he sees his mom he will be drunk. As above he is lovely apart from this. I am currently pregnant and have been in hospital for 5 days I was so ill I thought I was dying as I have hyperemesis severe sickness – he knows all this and only 4 days after I came out (still really ill) he went to a cricket game was out all day. I texted him (the first text I sent him as I didn’t want to bother him) about 3.00 pm and he had been out since 7.30am as I had a letter saying I would need another needle because of my blood type and I texted asking if he would have a blood test he instantly called me shouting “no” down the phone he was horrible and could barely speak. I cried and asked him to sober up. he said he would and that he wasn’t drunk and he promised me. He then came home out of his face and because my mom was with me at the time he was saying he wasn’t even drunk even thou he could barely stand and speak my mom got angry and said “yes you are out your face” and he just turned saying he’s not having it, he said the most hurtful things to me and wanted to finish with me which upset me that much I really thought it would harm the baby as I was hysterical after what I had been through it was like a nightmare, he wanted to drive the car so I snatched them out his hand and he was pushing me out the way. To be pregnant and to go thru so much I couldn’t believe it was happening to me. The next day he apologised as usual, said this time is different which I hear all the time and that it won’t happen again but how do I believe that when he has let me down so many times. He is now getting nasty when he is drunk and he lies to me all the time. I could carry on forever with the problems that his drinking has caused. He said that he won’t drink thru the rest of my pregnancy (6mths) and only a week later he was already asking me when he should go out for a drink but I’m petrified that he will hurt me again and he is using the excuse that he wants to prove to me he can do it. I said what about you saying you won’t and he said he will not do it. I begged him to get help, at first he said he would and now he said no way he was not got a problem and he will point blank not see anyone. What do I do please help. Hello Worried. I feel for you. You need immediate help as a couple to get through this. It seems like your husband does need to stop drinking, but if he’s not willing to stop, are you ready to cope with it or are you ready to start another life without him? Seek help yourself from Al Anon, and perhaps with a counselor. The answers will become cear with time. You are not alone. Feel bad now, forgot to mention that my husband is the best person in the whole world when he is sober. Everyone loves him. He’s polite, kind, loving and just an all-round great guy. And I love him to death, through sickness and health… literally! That’s why I’m hurting so much to see him like that! My husband is a binge drinker. I can say that quite confidently as I did the research on his behaviour, and he definately is a binge drinker. We only got married 2 and a half months ago. About 2 months before our wedding I confided in his best friend, as the binges were happening quite often. His best friend assured me that it was pre-wedding stress, and that he was sure it would not carry on after we get married. I then left it alone, but was relieved that his best friend knew how I felt about it, so that maybe he would not encourage drinking anymore. My husband’s problem is that once a drop of alcohol touches his mouth, he will not stop drinking until he is left at the bar all alone. When he gets home, he’s usually shlurrrrring his schppeech and absolutely wasted. When I get mad at him, he gets very aggressive, not physical, but aggessive to the point that I am scared of him and the way he talks to me and the things he says. And I always end up crying myself to sleep. And then the next day, I’m the one that suffers from sleep deprivation and puffy eyes and the obvious hurt in my heart. Once, he “fell” and cut his eyelid and was bruised all round his eye. He swears it was a fall, but I don’t think he even remembers. There is still a scar on his eyelid today. A couple weeks ago, he arrived home at 4am, wasted as usual, and with a fat “botox” bottom lip. He admitted that he did not really remember but he’s sure it must have been a fall. When he came over to my side of the bed to talk to me and I said “leave me alone, i’m sleeping”. His response was “well F$@# Y@% then”. The next day when I told him what he said to me, He did not remember and said he was very sorry. On the Monday night, I decided to just do it, talk about his problem and what he plans on doing about it. At first he was like “I don’t want to talk about this” and then I said “oh yes, we are talking about this” I said “You have a problem and you need to stop drinking alcohol because you cannot control what alcohol does to you. You allow the alcohol to control you and that is not ok. Don’t worry, it’s not your fault, it’s in the fibre of your being. That’s just how you were born and you need to recognise this before it kills you”. He got angry and said “Why do you tell people I’m an alcoholic? !” I said “I never told anyone that, because you’re not an alcoholic”. He said “So then what were you just saying? !” I said “Alcoholics are dependent on alcohol, which means that they cannot function without it and they drink everyday. You are not an alcoholic, but when you do drink, it is a big problem”. He said “Well then why is everyone saying that I’m an alcoholic?! Because you told ‘Chris’ (that time I told his best friend that he has a problem) and now everyone knows ’cause he opened his big mouth and now everyone thinks I’m an alcoholic!!! !” And then he just got very angry and shouting that I decided to leave the room and that was the end of that. I can’t just leave it because it will happen again! I don’t know what else to do?! I tried talking to his mother once and she was just as much in denial as he is, I think she was offended that I could even think that anything is wrong with him. And I can’t talk to his father ’cause everytime we see him, the two of them just get wasted together (genetic perhaps). I just don’t know what to do anymore… I’m desperate! I even offered to go to AA with him. I even told him that he doesn’t have to say anything and that I would say that I am the one with the problem. But then again, why would he go to Alcoholics Anonymous if he is not an alcoholic! Sorry for the very long story, feels good to get it out. If you read the whole thing, THANK YOU! That’s support enough! I believe that a person in denial is difficult to reach… and, it is impossible to help someone who does not want to be helped. Telling someone that they are in denial might plant a seed, but normally it will go in one ear and out the other. For those that do come out of denial, they can stop alcoholism. I have to say that alcoholism is something that can not only destroy the person but will also put the famiily and friends through a lot of pain. What to say to an addict in denial?